Happy New Year! It is only fitting that our first project of the new year will be to create your own spine label and personalized binder cover. 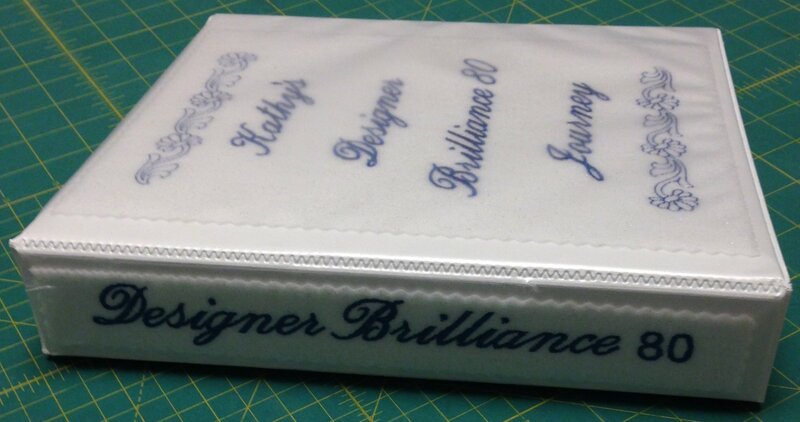 Then you can use your customized binder to store all of your Designer Brilliance 80 Club handouts and sample stitch outs in the coming months. You will then be creating your own reference book to document your journey as you explore and use the features within our Top-of-the-Line Designer Brilliance 80. In this three-hour class we will be using our built in Fonts and a design to create and stitch out the personalized spine and cover. We will also be exploring and reviewing other features within our Designer Brilliance 80. The spine and personalized cover were stitched out on white felt and slip inside the clear covers on the outside of the binder.